I tried everything to solve my predicament. At one point, I invited a group of friends over to prepare waffles for me. My thinking was simple: perhaps it was not the waffles I was getting tired of but the process of making them. Wrong. Could you believe it was the waffles themselves? To help waffles reclaim their rightful place in my heart, I began researching their humble origins. My hope was that reading the history of the waffle would re-ignite my dormant love for the buttery, doughy treat. My research led me to discover that “American” waffles, which I had been eating, are widely considered to be inferior to waffles with Belgian origins. While American waffles use a baking powder-leavened, pancake-like batter (poured into the crevices of a steaming-hot waffle iron), Belgian-created waffles are different. Indeed, the two types (Brussels waffles and Liège waffles) offer far more to the discerning waffle connoisseur. Brussels waffles are generally prepared with an egg-white leavener, while Liège waffles opt for a yeasted, brioche-like dough. Both Belgian varieties have textures that are surprisingly different from the standard American fare. Interestingly, what we in North America call a “Belgian waffle” is quite unpopular in Belgium. The American “Belgian waffle” is a simplistic recipe (baking powder instead of whipped egg whites) for Brussels waffles. Their creator, Maurice Vermersch, originally called them “Bel-Gem waffles” when he brought them to the 1964 New York World’s Fair. He chose the name “Bel-Gem” since he found that many Americans could not identify Brussels as the capital of Belgium. Over time, “Bel-Gem” morphed into “Belgian”. And that’s why, in the North American vernacular, the from-Belgium Liège waffle has almost completely disappeared. For most, the only Belgian waffle is a haphazardly-created Brussels one. Given how much better yeast-leavened Liège waffles are compared to their baking powdered-leavened American counterparts, this is a shame. The texture of a Liège waffle is akin to a brioche: doughy, rich, and dense. The use of yeast over baking powder gives the treat a delightful chew. They are the most common type of waffle eaten in Belgium. They are the best waffles eaten in Belgium. They might even be the best waffles eaten anywhere. But what makes Liège waffles so magical is not just the yeast that makes them rise, but also the sugar that makes them dance. Inside every Liège waffle one is sure to find embedded pearls of sweetness. Produced in Belgium, “pearl sugar” is the not-so-secret ingredient that makes these waffles shine. About the size of a red currant berry, each sugar pearl dramatically elevates the waffle-eating experience. 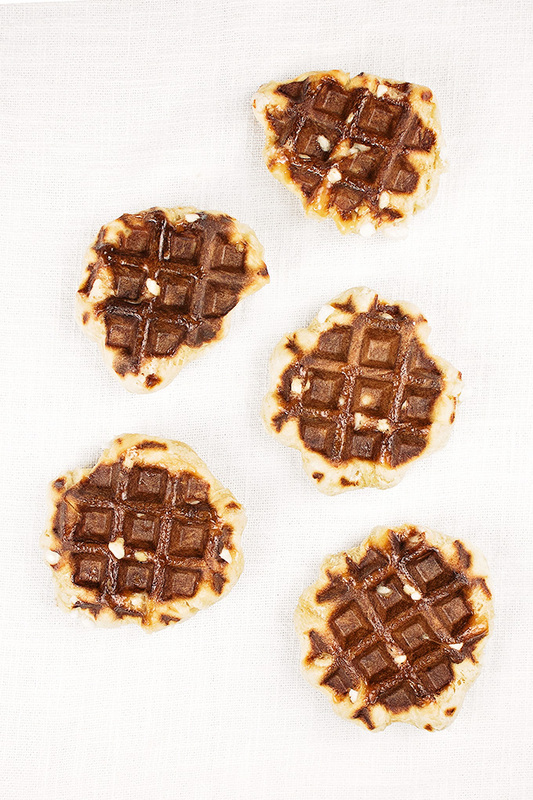 Pearls inside the waffle stay crunchy while those on the waffle’s surface caramelize during baking, coating each waffle with a thin layer of crunchy caramel. Simply remarkable. When buying pearl sugar, ensure you purchase Belgian pearl sugar rather than Swedish pearl sugar. The latter, while almost identical in appearance, does not melt properly in a waffle iron. While I bought Waffle Pantry-branded Belgian pearl sugar on Amazon, I know Lars is also a popular brand. While I could share in many words how delicious these are, I will use just four: I love waffles again. 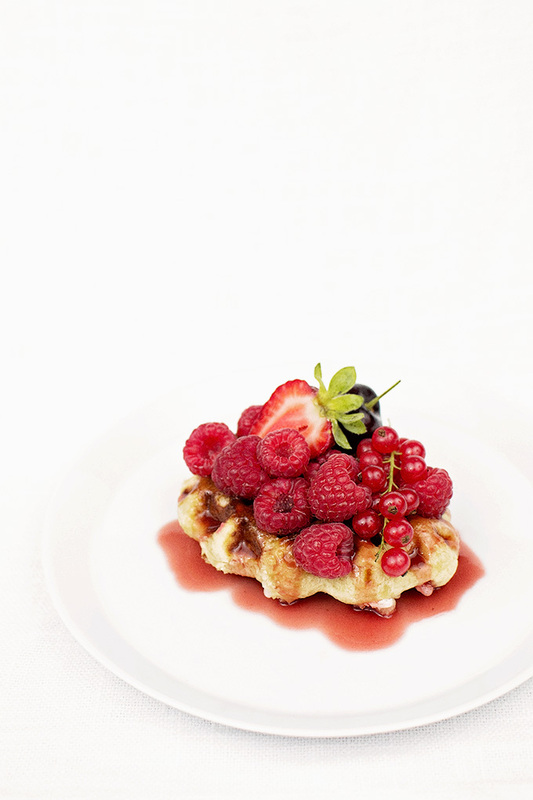 Authentic liège waffles with pearl sugar, served here with sour cherry sauce and red fruit. Recipe modified from the work done here and here. Stir the warm water, yeast, brown sugar, and honey together in the bottom of a mixer bowl. Let rest about five minutes. Whisk in the eggs, vanilla extract, and salt. Add the flour and, using the dough hook attachment of a stand mixer, mix on the lowest speed until a ball of dough forms. You will need to scrape down the sides of the bowl every few minutes. Add the butter, about one tablespoon at a time with the mixer still running. Add the next piece of butter only when the previous piece has been fully incorporated. This may take about 30-45 seconds per addition and will require you to scrape down the sides of the bowl. While this step is mildly irritating, the results are worth it! 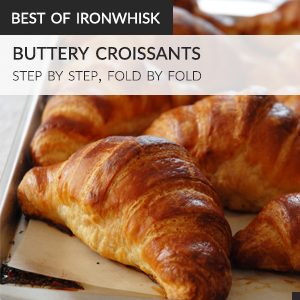 Once all the butter has been added, continue kneading with the dough hook attachment for five minutes. Cover the bowl and let rise at room temperature for four hours. Place in the fridge to chill overnight, up to 24 hours. Remove the bowl from the fridge and mix in all of the pearl sugar, which will seem like a lot. Depending on how big you'd like the waffles to be, divide the dough into portions/balls/mounds. This recipe makes about eight palm-sized waffles. Place a mound into the waffle iron and cook until nicely browned, probably 3-5 minutes on medium heat. Despite the temptation, do not remove waffles with your hands. The melted sugar is very hot. Also, note that these are far better fresh but if you are not eating them right away you may keep them warm in a 200°F (95°C) oven. You can also warm them up at that temperature later for 5-7 minutes before eating. I was hoping to get a lead on the pearl sugar in Toronto but I guess Amazon works too! I have been dying to make these waffles after having seen them on so many blogs. I’m interested in the waffle maker you purchased, it sounds incredible. Have you tried making mac and cheese waffles? So good! These were awesome but they wrecked havoc on my waffle maker. The sugar caramelized in the groves. OK, it was worth it. Great research and recipe Ilan. Thank you.